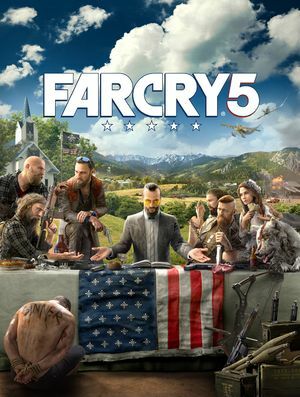 The Deluxe Edition includes additional weapons, explosives, vehicles, and skins. The Gold Edition includes all Deluxe content, the Season Pass and an exclusive sniper rifle. Included in the Deluxe and Gold editions. A bundle that includes: Ace Pilot Pack, Big Game Hunter Pack, Chaos Pack, Doomsday Prepper Pack and Explosive Pack. Available by preordering any edition of the game. FOV can't be changed by default; see Field of view (FOV) to fix. Cutscenes are pillarboxed 16:9 only; see Ultra-widescreen to fix. 60° to 120° horizontal. See Field of view (FOV). SMAA, TAA and SSAA via Render Scale setting. Open FC_m64.dll with a hex editor such as HxD. Change 00 00 10 41 to 00 00 40 40. Default FOV is locked at 60° for multi-monitor resolutions and when using ladders. Follow the steps below to fix. This hack requires bypassing the Easy Anti-Cheat protection; it's recommended to play in offline mode in Steam and Uplay to avoid being banned. Disable Easy Anti-Cheat for the game. Run Unlock_FOV.exe and apply patch to FC_m64.dll. It's recommended to backup FC_m64.dll before patching. 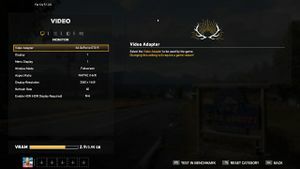 Run the game and setup your desired FOV in the game menu. Flashes red when taking damage. Versus only: Includes automatic matchmaking (not skill based) and lobby browser. Also skips the intro videos of the game. The embedded Easy Anti-Cheat component of the game prevents unknown third-party tools from injecting themselves in the game. This protection can be disabled, which allows the use of said tools. Download the latest version of the EAC bypass. Go to <path-to-game>\bin and rename EACLaunch.exe to EACLaunch.exe.bak. Go to <path-to-game>\bin\EasyAntiCheat and rename EasyAntiCheat_x64.dll to EasyAntiCheat_x64.dll.bak. Extract the downloaded archive to <path-to-game>\bin\EasyAntiCheat. Find bytes 40 55 53 56 57 41 56 48 8D AC 24 B0 FD FF FF. Change to B0 01 C3 56 57 41 56 48 8D AC 24 B0 FD FF FF. If using a DualShock 4 through Bluetooth, the game will not recognise it. A temporary workaround is to connect it straight to your PC through USB. You can get partial controller support by launching the game through Steam with Steam's XInput emulator however your dpad and left trigger will not work correctly. In case of game error of injecting see. 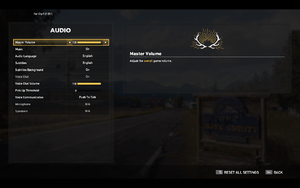 In case of FPS drops after using map, disable Reshade (bind the key in injector menu, settings - by default, beginning from 4.x version accessing by "home" key. Game now suppose to be perfectly playable on low details with 30-37 FPS on C2Q and HD 7870/R9 270. These recommended specs are for 1080p 60 FPS. 4K at 30 FPS is noted with (4K 30) and 4K 60 FPS is noted with (4K 60), and can be found at the official website. ↑ 1.0 1.1 File/folder structure within this directory reflects the path(s) listed for Windows and/or Steam game data (use Wine regedit to access Windows registry paths). Games with Steam Cloud support may store data in ~/.steam/steam/userdata/<user-id>/552520/ in addition to or instead of this directory. The app ID (552520) may differ in some cases. Treat backslashes as forward slashes. See the glossary page for details. This page was last edited on 22 April 2019, at 07:00.